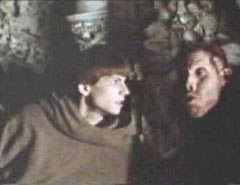 The oldest monk in the Abbey thinks Aristotle’s book of comedy is too disgusting and dangerous for the world, but he also can’t bring himself to destroy it. So the old monk keeps it hidden in a secret library. The secret library is mostly surrounded by other monks at the Abbey who seem to mostly all have different kinds of physical deformities. I think the old monk’s idea is that it is less dangerous to let those deformed (in body and therefore presumably in spirit) near to this dangerous text because their purity is already compromised in some obvious way. The ones who get killed by the *literally* poisoned book are the youngest and most perfectly formed of the monks. Maybe they are the ones who are most actively kept away from the book and who are not taught how to handle it without killing themselves. It was hard to not see this structure in my head for a few days after – this dangerous book of comedy surrounded by those deformed in body and spirit, who are in turn surrounded by the scholars circling, trying to get in to see what is at the center of the surprising deaths. I think we are to identify with the logical scholars – the clean and ready-to-go Sean Connery and Christian Slater, but it is hard not to identify completely with the deformed monks (especially the beautiful and ready-to-agree Ron Perlman), or the one female character (the filthy, grunting and seductive peasant girl known as "the girl" - Valentina Vargas), or even just with the book. If one identifies with the book, does that mean seeing oneself as simultaneously comic and poisonous, closest to the deformed of the world? That is a nice way of thinking about what an artist is: surrounded by the already-poisoned, the already-tough (in the present), ultimately swarmed by scholars (in the future). I like that. or seeing yourself as free. a book can't be tortured - also, it doesn't have to work anymore. it can only be killed. and only before the internet.